Ugh, this show is pretty cringy. Argh, Obsidian, why did you put this out at the game awards? In other news, Yong Yea is amusing because of his palpable frustration and boredom for a lot of it. I hate these live events like E3 and the game awards. They feel so fake and corporate. I only hate the games. I'm never interested in any. I do not know what to say. It's NOTHING of what I expected. They didn't show much but they did confirm this is the Tim Cain helmed game, and they rubbed some salt into the Fallout 76 wound by declaring the game to be from "THE ORIGINAL CREATORS OF FALLOUT" NICE. I am still optimistic, gotta wait for further details. By the way, you may check out its website now. Looks pretty good so far, although we won't really know until we see more gameplay footage. Why the rush to be gloomy gooses guys? 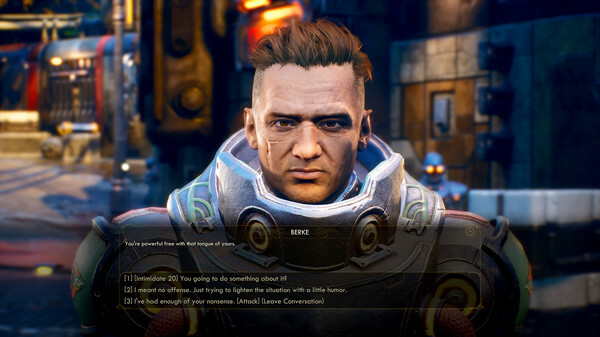 Well at least the dialogue system won't be like fallout 4. We're Fallout Fans, we can't help being depressed. I wanted a successor to fallout new vegas, not borderlands that's why.